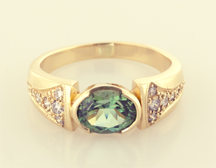 This is a recent creation setting a Maine tourmaline in a 14KT yellow gold ring with some diamond accents. Maine Tourmaline 1.30ct. 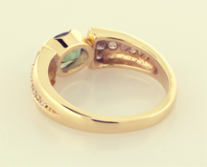 bezel set in 14KT Yellow Gold with .30cts. of accents pavé set diamonds.